PlayOJO casino is a relatively new brand in the gambling market as it was only established in 2017. Despite being new, the casino offers wide a collection of high-quality online slots, live dealer and table games to players from across the world. The casino has an amazing OJO plus concept where players are refunded their money on every lose or win and without winning limitations. 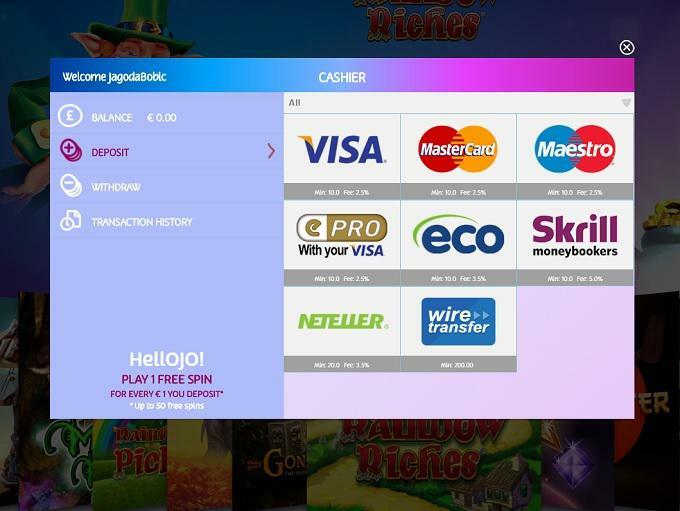 PlayOJO is managed and operated by Skill On Net and it holds licenses from the UK, Danish Gambling Authority, and Gambling Supervision Authority. One good thing about PlayOJO casino is that there are no wagering requirements at all. As of now, PlayOJO boasts of listing over 500 casino games, all from giant developers in the gambling world. They have some of the latest video slots from Microgaming, Yggdrasil, and Net Entertainment. Moreover, players have an option of playing different games both in trial and real money modes. The game library comprises of your favorite classic games like the table and card games and a handful of the live dealer and progressive jackpots. Slots: Lucha Maniacs, Rainbow Riches, Vikings Go Berzerk, Jungle Books, Winstar, Rich Wilde and the Book of Dead. Roulette: Reel King Roulette, French Roulette, Club Roulette, Italian Roulette, American Roulette, Roulette Machine and Lucky Lady’s Roulette. Live Dealer Games: Benelux Slingshot, Common Draw Blackjack, Baccarat Squeeze Live, Casino Hold Em, Blackjack Live, Manual Show A Blackjack, and Platinum Live Casino. There is no shortage of bonuses and promotions at PlayOJO casino. Players are rewarded with 1 free spin for every $1 on their first deposit. There an additional ‘ Kickers’ comprising of daily, weekly and monthly promotions for all players. As well, there is the OJO Wheel where gamblers have rewarded a spin on the wheel after they have unlocked certain levels. Lastly, the Reel Spinoffs are great chances of bagging free spins, thus, you need to take advantage of them. If you are looking for a casino with an advanced security system, then we recommend that you check out PlayOJO. The casino utilizes Secure Socket Layer (SSL) data encryption technology to ensure that your transactions and other details are not stolen by hackers. The casino is licensed by different authorities including the UK Gambling Commission, German Gambling Supervision Authority and Danish Gambling Authority. There is a friendly and knowledgeable support team working around the clock, 24 hours 7 days a week. Players with any questions can reach them via live chat, email, and Phone.